Ballindalloch sits high up in Speyside, near the spot where the River Avon empties into the Spey. It is truly lovely, picturesque setting. The first thing that you need to know is that the main house, Ballindalloch Castle, was founded WAY back in 1546, to serve as the family home of the clans Macpherson and Grant. For the last several years, it has played host to tourists, weddings, and corporate events from all over the UK. It really is an amazing place. It's history as a distillery is... well, let's just say "more recent." They decided to build a distillery on the grounds in 2001, and the first production came off the coolers in 2014. When it comes to production, there is an intersting twist that they are putting on the whole affair. Ballindalloch single malt Whisky -- once they actually have some to serve -- will be an "estate" Whisky. This means that everything about the making of the spirit will take place on the estates, from the growing of the barley, to the aging of the casks. We no little else about volume or techniques just yet, but we are eager to wait and see. Due to the persistent feuding of the various clans, the original buildings were less castle-like and decidedly more fortress-like, shaped in a z- formation for lots of shooting angles. Tom: Welcome to Ballindalloch. Ballindalloch, a castle, a farm, a sporting and forestry estate set in magnificent mountain country, bordered by sparkling rivers. But above all, home to an ancient Scottish family with a wish to share their heritage. 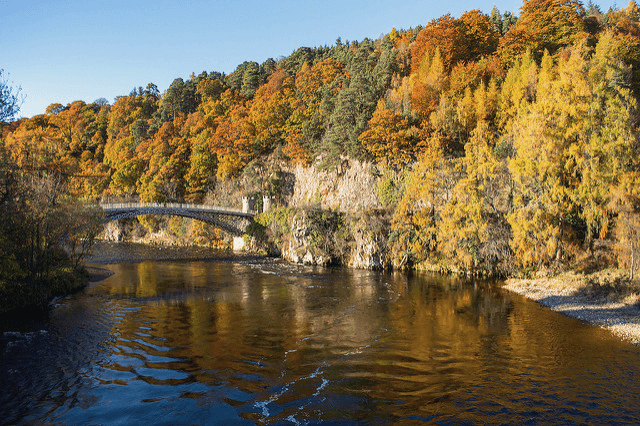 Ballindalloch rests among the hills and forests of Speyside, Whisky country, salmon country, land of the noble red deer, home to the soaring golden eagle. The area has been peopled for thousands of years. The present castle dates back to the 16th century. The Lord at that time planned to build his castle on a nearby hillock, but it's said that the fairy folk objected. That building tumbled down mysteriously. A voice told the Lord, "Build it in a coo-haugh", the cow's meadow. He did, and this is where it stands today. The oldest stone in the building, now the lintel of a fireplace, bears the names of two lovers, and a date. Over four centuries later, Ballindalloch is still the family home of the Macpherson-Grants. The eldest son of Ballindalloch, Guy, is chief of the Invereshie branch of the Clare Macpherson. Though he cannot call men to arms to do battle with neighboring rival clans, he does have responsibilities to the community. Officiating a the Aberlour Highland Games is one of his more pleasurable duties. Clan feuding in days gone by meant you needed a home to suit. Originally laid out in the traditional Z plan, the castle has been extended over the centuries. In less troubled times, successive families added rooms of a more gracious nature. Comfort and elegance became more important. And as new generations of the family arrived on the scene, their needs had to be looked after as well. Portraits of family past keep watch in the great hall, now the dining room. This is no museum, but a living room that regularly rings with the laughter and conviviality of good company. The lady of the house now Clare Macpherson-Grant, now Mrs. Oliver Russell, is watched with approval by her forebearers. General James Grant, soldier of note and governor of Florida in 1763. In recognition of his services to the Crown during the American wars of independence, he was presented with portraits of his King, George the 3rd, and Queen Charlotte, painted by Allan Ramsay. Every castle has its ghosts. Ballindalloch has a friendly one. It's reputed that the ghost of General Grant still walks the corridors, perhaps in search of his favorite room, the wine cellar. Once, this was the castle dungeon, but now it serves a much happier purpose. Through marriage, the family name became Macpherson-Grant, and in 1838, George Macpherson of Invereshie was created Baronet as Sir George Macpherson-Grant of Ballindalloch. In 1869, the fourth Baronet, another Sir George, together with the distiller John Smith, founded Cragganmore Whisky Distillery. But Sir George has an even greater claim to fame. In the middle of the 19th century along with two other agricultural improvers, he developed the now internationally famous breed of beef cattle, the Aberdeen Angus. The Ballindalloch herd is now the oldest surviving herd in the world. From it have come many famous prize-winning animals. The affairs of the farm and estate and looked after by Oliver Russell. The cousin of the Duke of Bedford, the present Lord runs his Highland estate with the same dedication as his predecessors, though nowadays, it must be run on much more commercial lines. Managing the estate is a heavy responsibility. The Ballindalloch team must regulate the many pressures on farmland, forests, and rivers so that its future will be as productive as its past. The woodlands and forests have to be sensitively managed, and today they're a haven for wildlife. Ballindalloch is a sporting estate. The summer is a busy time for the gamekeepers. Pheasants and duck to be looked after. And then in August, visitors will come to the hills in search of grouse. The River Avon, spanned by the old bridge near the entrance to the estate, is noted for its salmon. But even more famous are the fish that come from where two great rivers meet, the junction pool, where the River Avon meets The Spey. Anglers from all over the world dream of catching a salmon here. The glory of Ballindalloch must surely be the castle gardens, all year round, reflecting the seasons and beauty that is Speyside. The magnificent walled garden, a profusion of color and perfume. And pride of place at the castle must go to the exquisite Ballindalloch rose. Ballindalloch Castle and Estate, part of the wider community that is Speyside. A community which always takes time to welcome visitors to share its pleasures and pursuits. Ballindalloch welcomes you to Speyside, and the Macpherson-Grant family welcome you to Ballindalloch.